I decided that since Pluto is still on everyone’s mind I would continue the theme of Pluto related topics for the rest of the week. 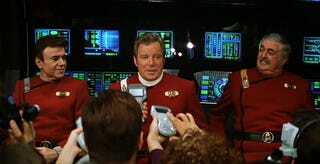 Did you know that Pluto was where the Enterprise-B was headed at the beginning of Star Trek Generations? IMDB has the script for the movie. John Harriman is the captain of the ship, managing what he thought would be a simple PR meet and greet type voyage. That is until the plot came to visit. Here is the full opening if you want to see the whole scene. I can only hope, that as we continue to let new information about that orb, floating so far away in the heavens, that someday traveling there will be simply a “quick run around the block”. And with that, I wish you a pleasant day and I will see you again, on the next Fact Of The Day.